SECRET INVESTIGATION REPORT : Nawaz Shariff Led PML N Promoting Yellow Journalism to Retain their Corrupt Govt. JNN 30 Aug 2014 Karachi : A Pakistani Intelligence Agency has Uncovered a PML N Govt another Corruption Plot to Buy the Prominent TV Anchors & Columnists of the Nation , In order to gain their Support to Counter the threat of eviction of the PML N Govt by the Protesting PTI , and PAT Workers staging a Sit In in front of the Parliament House Building in Islamabad . An amount of 200 Million was disbursed among the Prominent Journalists , which includes the Names of Nusrat Javed , Mehr Bukhari , Mushtaq Minhas, Javed Ch. , Waseem Badami , Talat Hussain, Mazhar Abbas , Hamid Mir , Kashif Abbasi , Ijaz Haider , Babbar Sattar , Saleem Safi , Naseem Zehra , Matiullah Jan , Shahzeb Khanzada , Rana Jawad , Absar Alam , Iftikhar Sherazi , Mujeeb ur Rehman Shami . The Proof and authenticity of the above claims can be easily checked by the common viewers and Listeners of their Programs , as if even a common Pakistani analyzes the Moto of the above named Journalist to be defending the Nawaz Shariff and Shehbaz Shariff Led PML – N Govt , even they are the People behind the Brutal Murder of 14 Innocent and Unarmed Pakistani Awami Tehreek Protesters . And at the same time giving these Protest a twist of Sectarinism , which has nothing to do with sectarianism , while the Protests which are totally against the corruption , Nepotism ,and Total Fraudulent General Election in Pakistan . 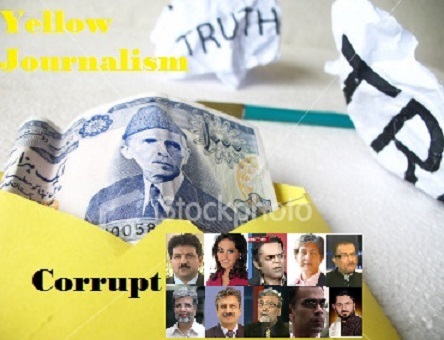 At the same time Many of these Flag Bearers of Yellow Journalism are being tasked to Propogate Sectarianism in Pakistan , under the Banner of War of the Giants between Baraelvis , Shias and Liberals against the Deobanbi Terrorist Organisation , and make the People of Pakistan Belief that these Protest has nothing to do with their Just Cause of Corrupt Judicial , Administrative and Electoral Reforms. As Due to this Corruption , Nepotism , Ruling Democratic Monarchy , and Fraudulent Elections the Beneficiaries are the Ruling Class , who all are against these Protests as any body can see that in the name of Democracy , all the Parties which benefit from this Corruption and Nepotism have come forward against them in the Name of Democracy , and even the US Govt , which Plants their agents to control the Govts of Different countries in the Name of Democracy and Liberalism are all against these Protest , and change of this Corrupt System . The Nefarious Design of these So called Journalist can also be gauged on their personal Social Media accounts , whether Twitter , Face Book or other social Media Accounts , as they are trying to Propagate the Message of Nawaz Shariff , which contains the Material of Sectarianism as He is the sponsor and supporter of Talibans and their allied Terrorist Parties which include Sipah e Sahaba Pakistan , Lashkar e Jhangvi and other sister concerns , in the Name of Liberalism and Neutral Opinions . Mehr Bukhari , Javed Ch. , Kashif Abbasi , Nusrat Javed , Hamid Mir and others who have always taken Journalism as their Money Making Machine, and have always done everything to make More and more Money , Power , concessions from it , and in this Pursuit this time they have Joined Hands with Nawaz Shariff Govt . who wants to Counter the threat of Impeachment from the Sitting federal and Provincial Govts Due to the General Public Anger and Anguish of a Common Pakistani , who has come forward Unitedly for the first time regardless of their Cast Creed , Sect and ethnicity . It should also be noted that among the same Lot of So called Journalist, which includes the Names of Ansar Abbasi , Hamid Mir , Javed Ch. , Mujeeb ur Rehman Shami , Who have also been writing for the Jihadi Literature and their allied Magazines and Papers under their Ghost Names , which were Promoting Radicalization and Sectarianism , among which some of the Papers and Magazines are namely as Jaraar , Zarb e Momin , Ghazva , Caliphate Rashida and Others . As per our Sources claim Javed Ch. , code name is Yasir Khan , with which he is associated with the Magazine Zarb e Momin on its cover . These are the same So called Journalist who have written and Promoted Radicalization and Sectarianism for the Universal Jihad Network for their Monetary Benefits and have always Praised their efforts and Terrorist activities , upto such a Limit that the Terrorists are Portrayed as Hero of Islam . Mujeeb Ur Rehman Shami , Javed Ch. , Hamid Mir , Ansar Abbasi are the Ones who have been associated with Organisations like Jamaat Ut Dawa , Jama Rasheedia and they have not only contributed their Articles , but have also taken part as Moderator , Lecturers , Instructors in the Jihadi Journalism courses , which were responsible for the Creation of Jihadi Journalist , and were given Internship in the Newspapers like Jang , News, Geo , Nawa e Waqt and Daily Pakistan . These People have Heavy contribution in these Radicalized , Sectarian Jihadi Promotional Organizations , and these Organisation were in One way or another being always associated with the Nawaz Shariff & PML – N . While the People who have received the training in the courses conducted under their guidance and Instructions have created a Lot of Nuisance and sectarian Material on the Social Media , Print and Electronic Media of Pakistan. These Group of So called Journalist Have not Only commercialized Journalism , and in their Hot Pursuit for Wealth and Power . But they Have Not only contributed to the Radicalization and Sectarianism of the Society , as they have even Promoted the terrorist Personalities on the Print and Electronic Media , by calling them in their Programs and Have tried to create a Soft Corner in the hearts of the Innocent Citizens of Pakistan , who are Not Much aware of the Whole Scenario , but in their love for their Religion Islam have ended up in Joining the Terrorist Camps . As they have Painted the Pictures of Osama Bin Laden the Chief of the International Terrorist Organisation Al Qaeda , Hakeem Ullah Mehsud Chief of Terrorist Netowrk Tehrik e Taliban ( TTP ) , Ahmed Ludhianvi Head of Sipah e Sahaba Pakistan ( SSP ) , being not terrorist But the real Heroes of Islam. This entry was posted in Asia Pacific, Pakistan News and tagged Geo News, Hamid Mir, Jang Group, Javed Ch., Kashif Abbasi, Nusrat Javed, The News, Yellow Journalism. Bookmark the permalink. Pingback: VELAYAT TV USA – SECRET INVESTIGATION REPORT : Nawaz Shariff Led PML N Promoting Yellow Journalism to Retain their Corrupt Govt.